Arsenal manager, Arsene Wenger, has said that Alex Iwobi will be fined, if it is true that he was partying until 3.30am the day before their FA Cup third-round clash at Nottingham Forest. According to The Sun, Iwobi was caught on camera dancing in central London at 2.37am on Saturday morning and the video was uploaded to Snapchat. 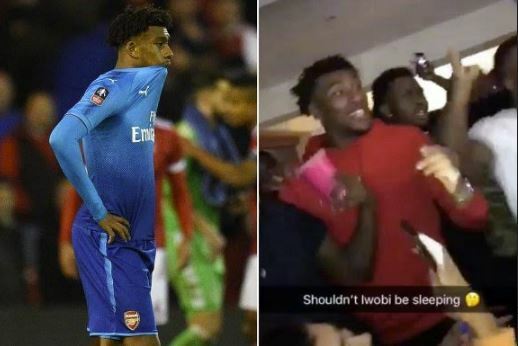 The clip captioned, “Shouldn’t Iwobi be sleeping?” and shows the 21-year-old dancing and singing among a group of people. It is understood that the group rented a flat in Soho and partied until 3.30am. “If that is true he will be fined. It’s unacceptable,” Wenger told reporters on Tuesday morning. Iwobi played the full 90 minutes as the Gunners suffered a shock 4-2 defeat at the City Ground.